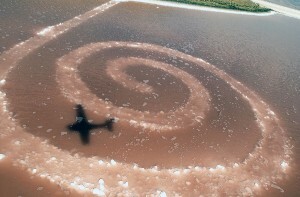 Aerial view of Spiral Jetty showing pink salt water and black basalt boulders draped with a crust of white salt crystals. Lake level is 4197.3 ft. Copyright, Francisco Kjolseth, Salt Lake Tribune, August 28, 2002. It’s early September 2002 at Rozel Point in Gunnison Bay (the north arm) of Great Salt Lake about 16 miles (24 km) from the Golden Spike National Historic Site. A spiral form of salt-encrusted basalt boulders is just emerging from the pinkish water. Seldom-seen Spiral Jetty is visible again! 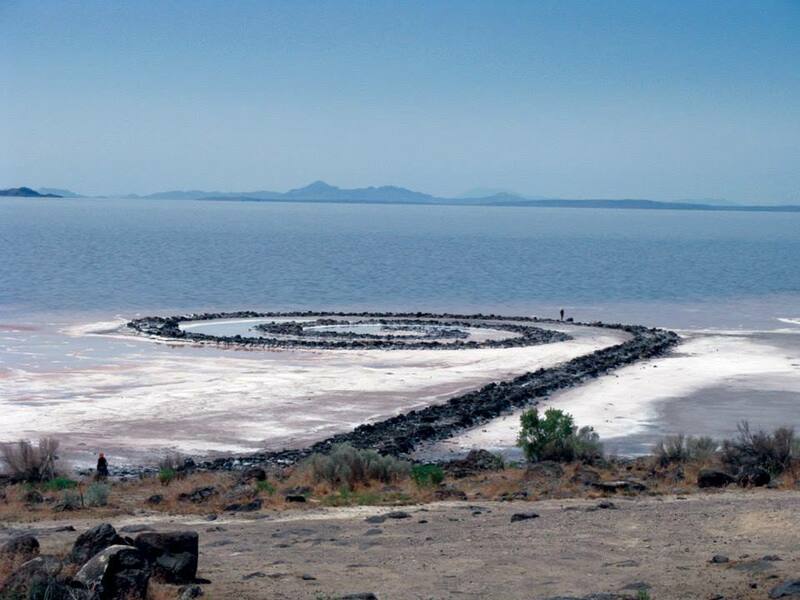 Artist Robert Smithson created Spiral Jetty in April 1970 and later donated the earthwork art to the Dia Center for the Arts in New York. Great Salt Lake’s setting and the artistic contrast between the pink water, white salt crystals, and black basalt boulders evidently inspired Smithson. But perhaps the most intriguing aspect of Smithson’s creation, which is 1,500 feet (457 m) long and 15 feet (4.6 m) wide, is that it is only visible when climate conditions cause the level of Great Salt Lake to drop below an elevation of 4,197.8 feet (1,280.2 m). The water’s pink color is due to a red pigment in the salttolerant bacteria and algae that survive in the north arm’s extreme 27 percent salinity. Great Salt Lake was split into two parts by a rock causeway constructed across the lake by the Southern Pacific Railroad in 1959. Before the causeway was built, fresh water from the Bear, Weber/Ogden, and Jordan Rivers circulated throughout the entire Great Salt Lake. When the causeway was built, circulation became restricted and salt content of the north arm increased because most of the river water flows into Gilbert Bay (the south arm). 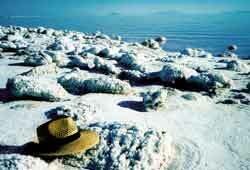 White salt crystals encrust almost any solid object in contact with north-arm water. The black basalt boulders Smithson took from the beach to construct Spiral Jetty are no exception; they are now covered with salt crystals. The basalt boulders are from local volcanic eruptions during Pliocene time, about 5 to 2 million years ago. 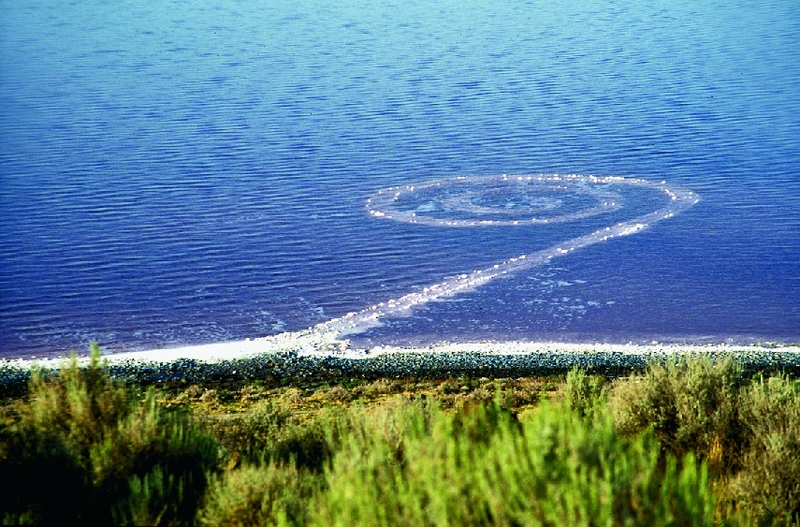 Spiral Jetty surfaced several times between 1970 and 2002. 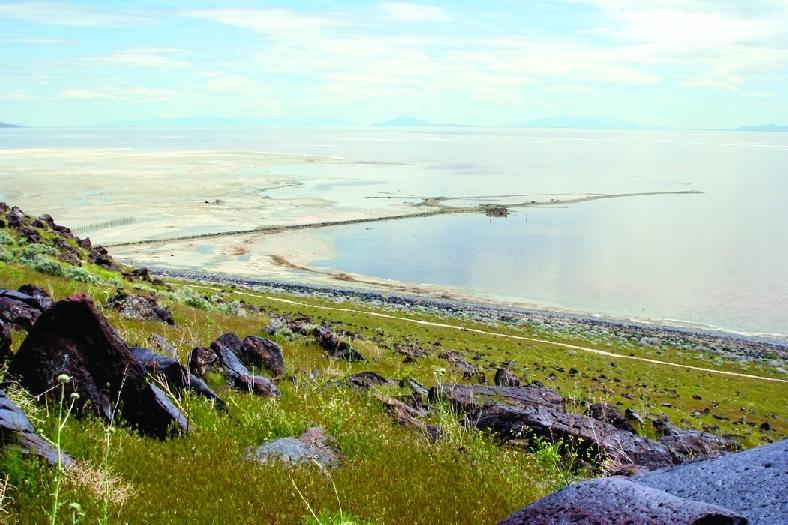 Throughout the lake-level fluctuations Spiral Jetty survived wave erosion; the hard salt crust probably cemented the boulders together and provided a protective layer on the jetty surface. Drive to the Golden Spike National Historic Site (GSNHS), 30 miles (45 km) west of Brigham City, Utah by following signs on Utah State Route 83 through Corinne. Once at GSNHS take the gravel road leading west toward the West Side Drive approximately 6 miles (9 km) to an intersection that has a small white “Promontory Ranch” sign. Take the south (left) road from the “Promontory Ranch” sign intersection and continue south about 1 mile (1.5 km) to an intersection near a corral; veer right to the road that heads southwest and continue about 9 miles (13.5 km) to Great Salt Lake at Rozel Point. You will see a linear jetty associated with past oilfield activity, and, if the water is low enough, the Spiral Jetty.